Meet has a thorough understanding of key nanotechnology topics, including the synthesis of nanoparticles, nanomaterial characterization, analysis of gas sensors, fabrication of solar cells, and the green synthesis of quantum dots. 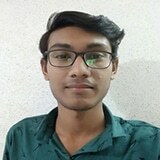 Up to his graduation, he worked on fabricating a highly sensitive nanostructure SnO2 based gas sensor for the detection of environmental pollutants. Meet also investigated the performance of dye-sensitized solar cells by employing natural dye “anthocyanins” extracted from tomato slurry, as a sensitizer for the TiO2/CuO photoanode. Korgaokar, S., Moradiya, M., Prajapati, O., Thakkar, P., Pala, J., Savaliya, C., Parikh, S., Markna, J.H., 2017. Highly sensitive nanostructure SnO2 based gas sensor for environmental pollutants 40050, 40050. https://doi.org/10.1063/1.4982134. Pala, J., Mordiya, M., Virpariya, D., Dangodara, A., Gandha, P., Savaliya, C.R., Joseph, J., Shiyani, T., Dhruv, D., Markna, J.H., 2017. Analysis and design optimization of organic dye-sensitized solar cell based on simulation 30004, 30004. https://doi.org/10.1063/1.4982082. Savaliya, C.R., Jh, M., 2017. Tailoring of magnetic hyperthermia treatment using superparamagnetic iron oxide nanoparticles 174–175. https://doi.org/10.15406/mojbm.2017.02.00038. Moradiya, M.A., Dangodara, A., Pala, J., Savaliya, C.R., Dhruv, D., Rathod, V.R., Joshi, A.D., Shah, N.A., Pandya, D., Markna, J.H., 2018. A natural tomato slurry as a photosensitizer for dye-sensitized solar cells with TiO2/CuO composite thin films. Separation Science and Technology (Philadelphia). https://doi.org/10.1080/01496395.2018.1444053. Soonmin, H., Shanmugam, M., Moradiya, M., Markna, J.H., 2018. Review of dye-sensitized solar cells based on polymer electrolytes 7, 3001–3006. https://doi.org/10.14419/ijet.v7i4.14041. Meet’s area of expertise is not only in nanophysics but also nanomedicine. He has a passion for writing about nanotechnology, as well as the latest science news. He has been a freelance science writer since April 2018 and he chooses to write about anything interesting in the field of sensors, quantum science, lasers, the environment, chemistry, and physics. As a freelance writer, Meet’s work has appeared in many AZoNetwork sites. Solar energy is considered to be one of the most promising energy alternative sources, but the availability of soil can limit the scope of its adoption. In floatovoltaics, floating solar panels not only save space but also conserve water and maintain its quality. The renewable energy is defined as energy that is collected from natural resources. Globally, the energy consumed has consistently increased over the last fifty years. Today, most energy is supplied by burning fossil fuels or created using nuclear reactions. This article discusses using thin films in solar cells as a new renewable energy.